Feel like spoiling yourself? Or do you want to give someone a beautiful present? Then choose a beautiful pair of gold earrings here. Do you have a preference for gold earrings in white gold, yellow gold or red gold? Would you like to look radiant with a pair of gold diamond earrings? You are guaranteed to find what you’re looking for on this page. 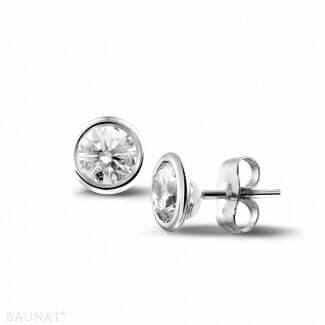 Why buy gold earrings from BAUNAT? Are you looking for a pair of beautiful gold diamond earrings? BAUNAT buys its diamonds straight from the source. Our direct purchases and sales allow us to cut out any unnecessary intermediaries, which means you can buy your gold and diamond earrings at an unbeatable price. In addition, all our gold and diamond earrings are made by hand in Antwerp, the home of the most talented artisans in the diamond industry. Which gold earrings will you find in our collection? Are you looking for a pair of classic gold earrings? Or would you prefer some trendy gold earrings? From studs to pendants, designer earrings and bar earrings: you will find them all in our varied collection. You will also be able to choose between yellow gold, white gold and red gold for your gold earrings. Plus, you’ll have a choice of different cuts for the diamond. 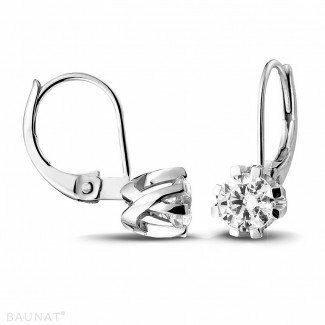 You can discover some extraordinary Belgian collections in the ‘BAUNAT Designer Jewellery’ line. Allow yourself to be seduced by these refined collections, which will symbolise and accentuate your elegance and inner beauty. Do you have a specific design in mind, which you can’t instantly find in the extensive collection of earrings? 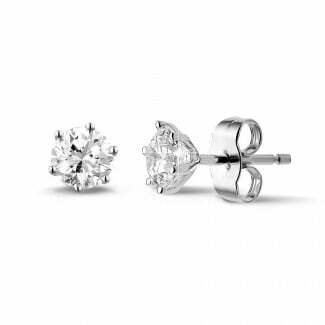 Go for a tailor-made approach and arrange for your gold or diamond earrings to be designed for you, completely in line with your wishes and requirements. You can always contact BAUNAT’s experts via phone, email or chat for extra advice.